Spice up your life with Salsa Music and Salsa dance! Warm up, there will be a lot of salsa dancing! Salsa phenomenon spreads worldwide! Be a part of it and get salsa radio today! Whether you want salsa music slow or fast, this radio fm has a variety of salsa radio stations to offer. Have salsa music on your Windows and feel the rhythm and passion of salsa songs! Make salsa dancing a part of your daily routine and relieve the stress by dancing to salsa dance music. Relax listening to best salsa songs. Salsa music lends itself well to any activity or a state of mind. 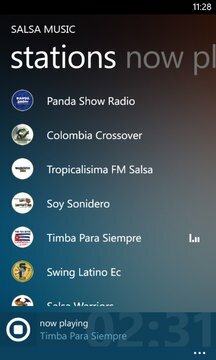 Whatever style of salsa music you prefer, check out this radio fm app and have your salsa songs at hand! 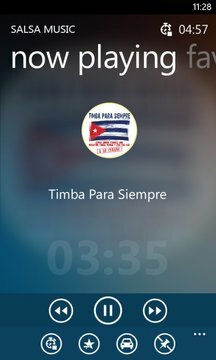 If you are fueled by the passion for Salsa music and dance, this salsa music app is tailor-made for you. With fm radio you will have salsa music free always at hand in case you feel like dancing. Salsa dancing contest can begin! Salsa Music and its code and design are a property of Wizards Time LLC and cannot be used without permission. Radio stations are under copyright of respective owners and hand-picked from free, publicly available sources. For submissions of new radio stations or a request for removal of existing ones, please contact us at office@wizards.rs. For information on licenses of music provided in the app, please contact an appropriate radio station. This app has been tested on the following Windows devices (Windows Phone 8, Windows Phone 8.1): HTC 8S, HTC 8XT, Huawei Ascend W1, Huawei Ascend W2, Nokia Lumia 520, Nokia Lumia 521, Nokia Lumia 525, Nokia Lumia 620, Nokia Lumia 625, Nokia Lumia 720, Nokia Lumia 810, Nokia Lumia 820, Nokia Lumia 822, Samsung ATIV Odyssey, HTC 8X, Nokia Lumia 920, Nokia Lumia 925, Nokia Lumia 928, Nokia Lumia 1020, Nokia Lumia 1320, Samsung ATIV S, Samsung ATIV S Neo, Nokia Lumia Icon, Nokia Lumia 1520, Samsung ATIV SE, HTC One M8, Nokia Lumia 510.